As Summer winds down giving way to a warm golden Autumn light, it’s fun and comforting to relive the experiences of the past months through photos and other souvenirs. This Summer has been particularly exciting for us, as Jacopo and I got married on July 14th in Arezzo (Tuscany) in what felt like a dream. This is the second in a series of posts about our BiniChic Wedding. It is through these posts that we’d like to share with you how we — along with our families — put together such a special event for us. 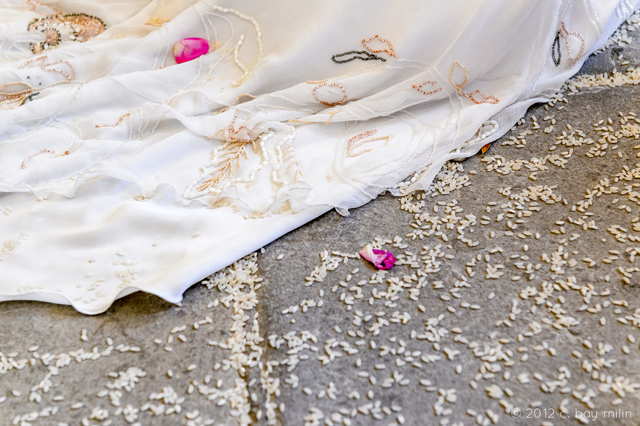 After the post about the invitation, it is only natural that we continue with one of the most important things in every girl’s wedding : the Dress. 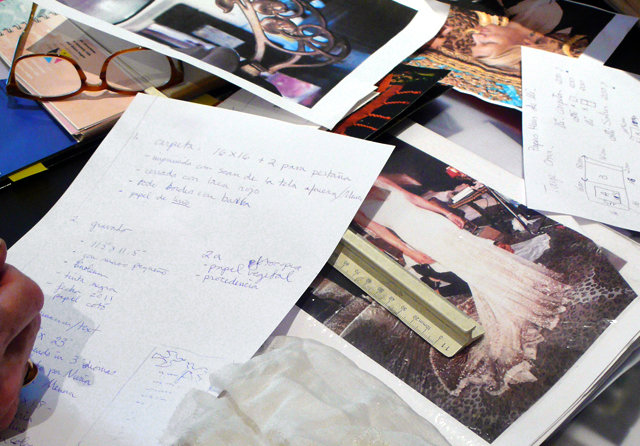 As the daughter of a couture fashion designer, it was only natural that the dress design and production would be orchestrated by my mother. I gave her some references for inspiration, and she came up with a labor of love that went above and beyond what I could have ever imagined. I knew I wanted a dress that had a vintage air, an elegant feel, and above all a personal and flattering style for my body type. Since we were to be married in a church from the Rinascimento and have the party at the 17th Century Villa of Il Cicaleto, I thought it would be appropriate to wear something that fit in with the locations. I really liked the idea of having a dress inspired by the 1920-30s — I loved the dress shapes and gorgeous beading of that era. 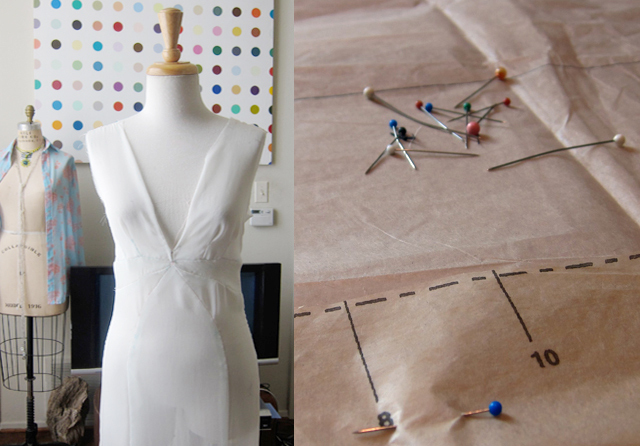 Susan found the perfect base to work from in an old dress pattern from Vogue — who would’ve thought! 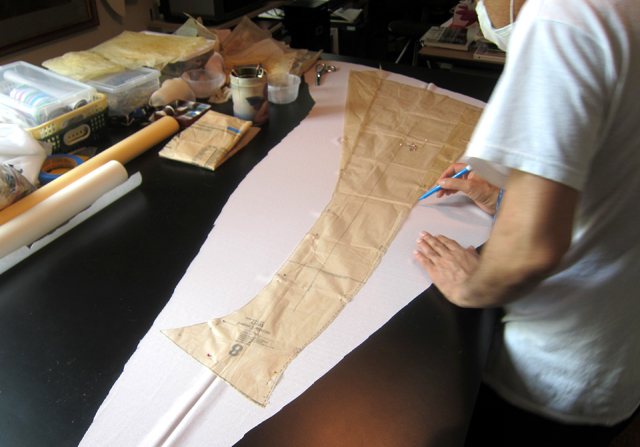 Our dear friend Shezi, — an amazing artist based in Dallas — is an excellent haute-couture designer, so he was in charge of transforming the Vogue pattern into the shape and size that would best suit me. 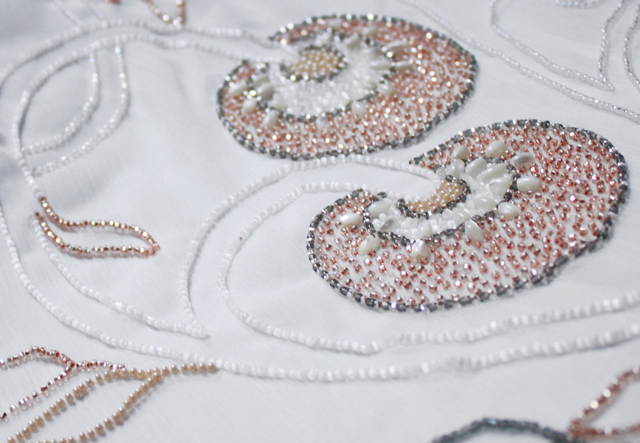 Since the original pattern was for a simpler dress, and mine was to have beading sewn onto the top layer, two completely separate dresses were created. 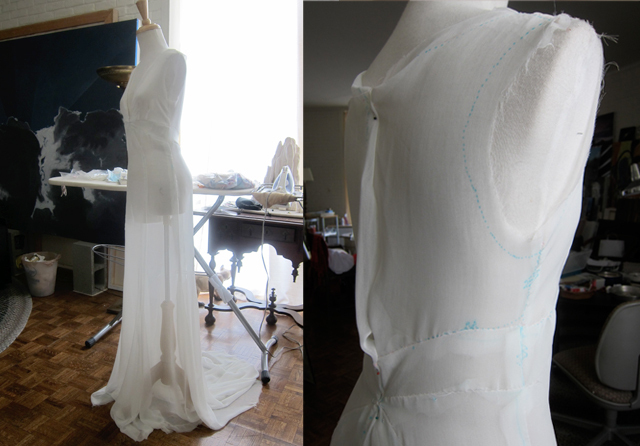 The top dress was made of white silk chiffon, and the bottom dress was white silk charmeuse. 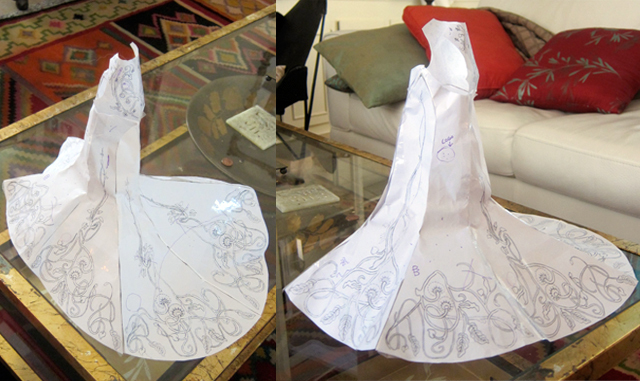 Here, images of the dress in the process of being created by Shezi. 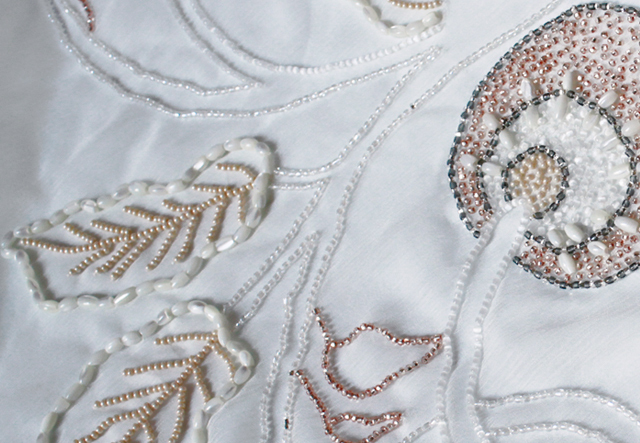 This dress was then to be re-created in Barcelona with the final embroidered fabrics. 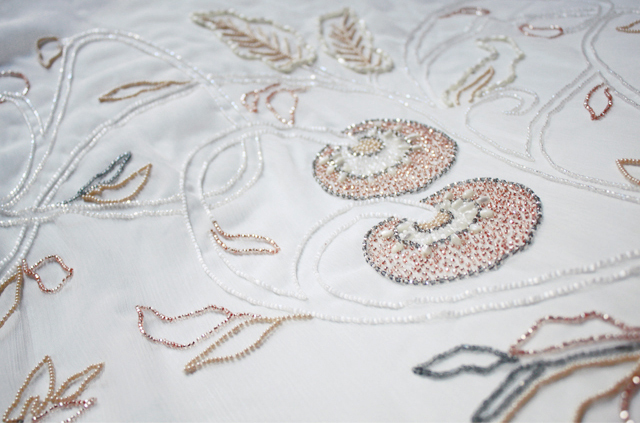 We knew we wanted to incorporate a part of Il Cicaleto’s history into the dress’ design, and that is how the idea of making a beading pattern inspired by the Art Nouveau lamp in the Villa’s kitchen came about. Some of you might remember this image from the post about our invitation, since we used the same pattern for both items. 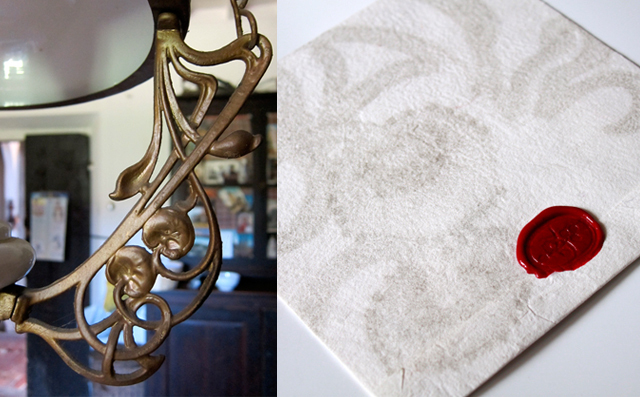 The lamp’s design had to be reinterpreted into a pattern that could then be expressed graphically in beading as well as on the invitation. The definitive illustration was made by Shezi. 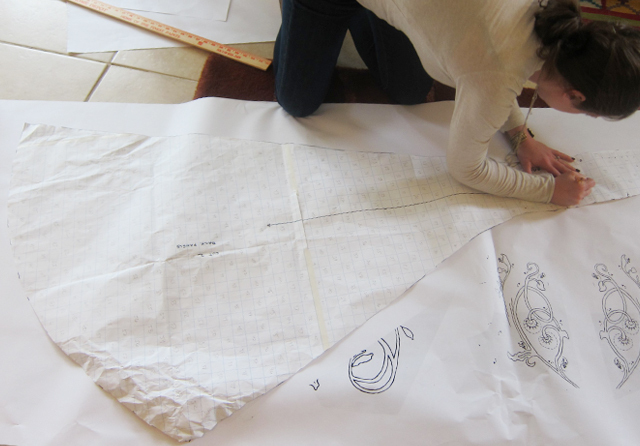 Susan and our very talented designer friend Sabrina then applied the drawing to the five panels that composed the skirt of the dress, as well as to its elaborate back. They made a miniature model of the dress (above) on which they plotted the way the design would fit into each particular panel. 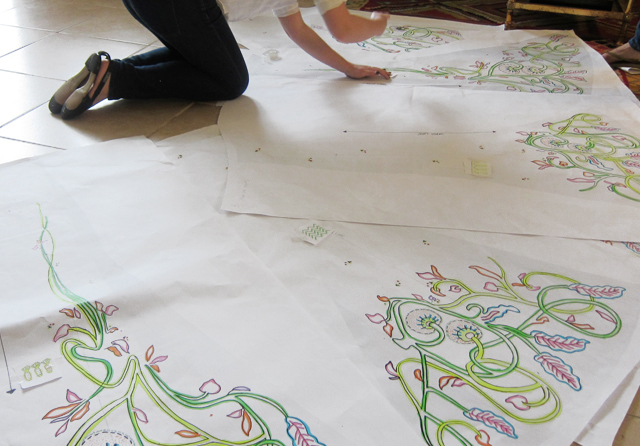 Sabrina then scaled the artwork on illustrator and we had it printed full size at Kinko’s. 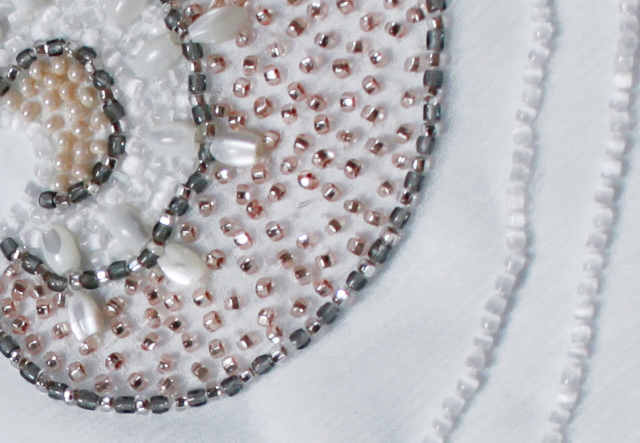 Susan assigned a color code to each kind of bead that was going to be sewn in the various parts of the design. 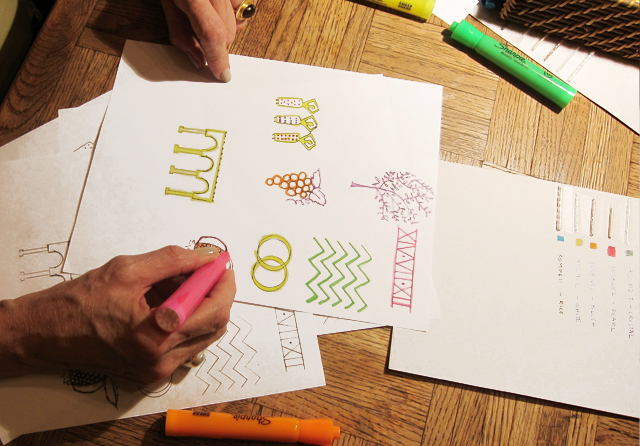 She also came up with different meaningful symbols — one for each panel and part of the dress. We’ll see all about their meaning on our next post about the dress. I went to Dallas for my first fitting and helped Susan and Sabrina color in the several panels (five for the skirt and two for the back) with the assigned bead color code. Everything was multiplied times two, of course, since there were two product packs to be sent to two different parts of the world (China and India). 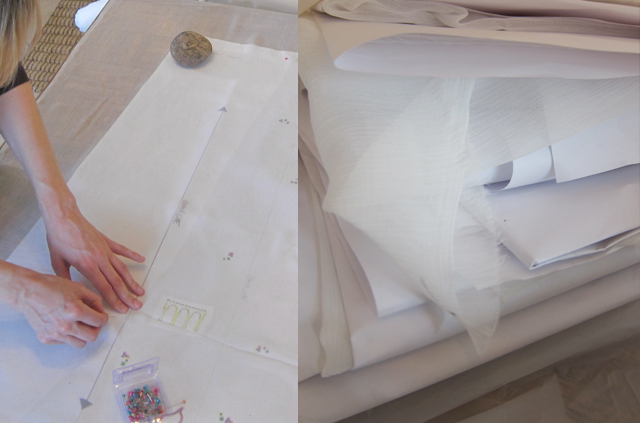 Each piece of fabric had to be attached to its specific paper panel to be sent to the embroiderers, making sure the grain of the fabric went in the right direction so it would hang just right when sewn together into my dress. The beads had previously been patiently counted and organized by our great friend Carlos. We then filled two boxes with the patterns, fabrics and beads and sent them off to India and China! We anxiously awaited the final result. A dear friend of ours in New Delhi, Taruna — owner of Taurus Home — kindly offered her most talented artisans to produce the elaborate beadwork. She sent us photos of the process that wonderfully illustrate the technique. 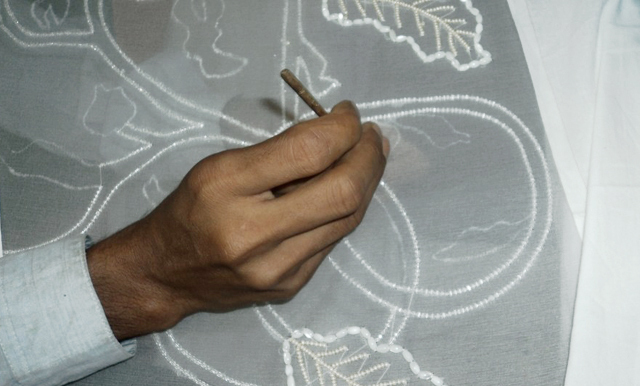 The beading in India was done in the traditional art of Zardosi. 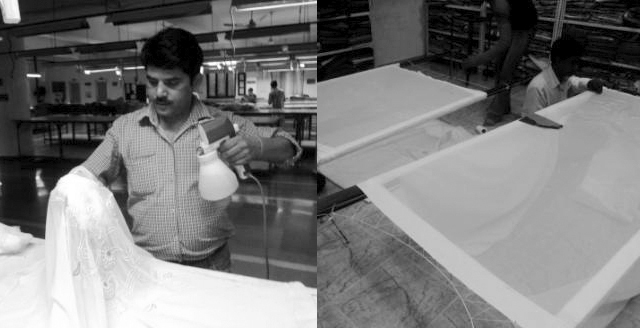 The process begins with the artisan first wetting the fabric and fixing it tightly on a freestanding wooden frame, called an Adda. 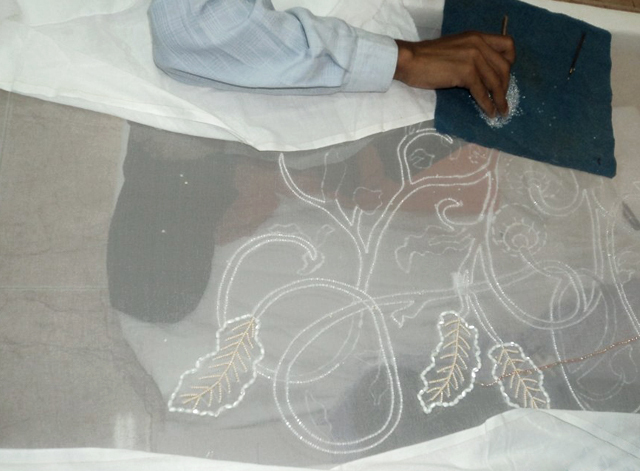 This form of embroidery was introduced in India from Persia by the Mughals and the original technique used gold and silver threads to make beautiful designs on wall hangings, bed sheets, silk, velvet, brocade as well as crepe. 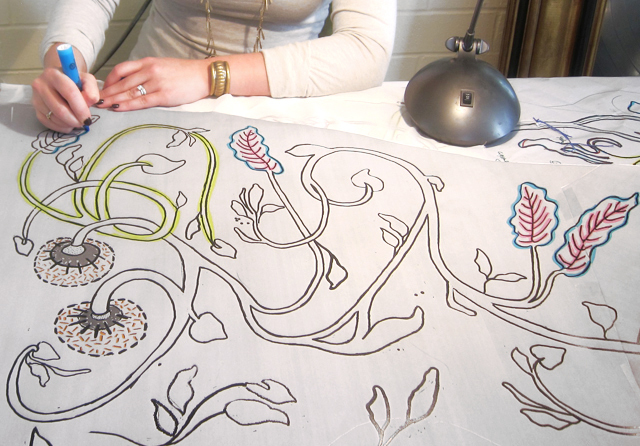 The artisan then places a piece of paper with the design pin-pricked on it on top of the fabric. Sprinkling chalk powder over the paper he transfers the outline onto the fabric. The artisan is then ready to start attaching the beads with an Aar needle, which has a small, bent tip similar to a crochet hook or rug hooking tool that catches the thread on the back side of the fabric, pulling it to the front side to create loops or attach beads. 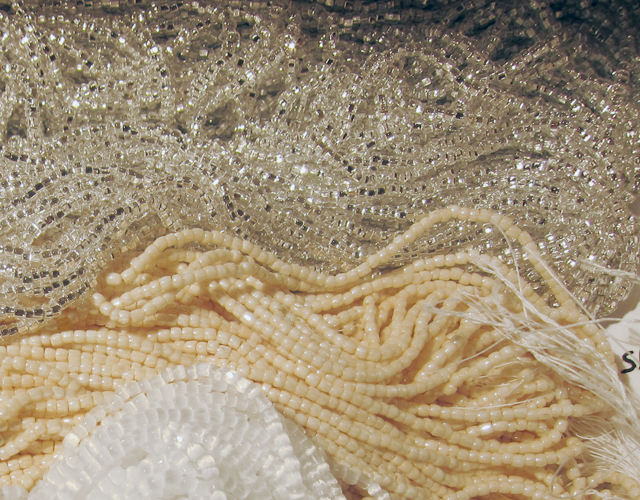 The artisan’s nimble hands twist and pull the hook and thread, effortlessly applying the beads on the fabric. I found a very illustrative video about the Aari technique, which is very similar to Zardozi. The beaded fabrics were then sent to Barcelona, where I live, and sewn together by a local seamstress following Shezi’s models. The final touch-ups of the dress were done in Arezzo, by the very talented wedding dress designer, Angela. We will soon post photos with the final results on the next post about the Wedding Dress. I feel extremely fortunate to have worn a bespoke dress designed by my mother, Susan Unger. It could not have been possible without the hard work and talent of Shezi, Sabrina, Taruna, the beading artisans, Carlos, Natalia, Angela and of course, Susan. They truly made me feel charmed! Photo Credit: C.Bay Milin, Susan Unger, Ona Villier Unger, Taruna Singhi. This entry was posted in Uncategorized and tagged artisan, binichic, design, fashion, history, textile, tuscany, villa, wedding. Bookmark the permalink. Ona, Susan told me about your beautiful dress but not in so many details. Sounds like a true labor of love. When I had dinner in Dallas with your mom, she treated me to some of the photos of the wedding. Bravo and Congratulations to you and Jacopo. A lifetime of happiness to you both. Hi Marci, it really was an honor to wear such a labor of love. Susan is a true artist! Thank you for your kind words, we’re very happy you enjoyed the post, and hope you keep reading our blog! Ona, Loved the posting about the dress. so dreamy. Gorgeous post! But now we want to see a photo of you in the dress — I hope Part Two is coming soon! Mary, you are such a wonderful and kind person, thank your for your friendship and support! I have looked at your photos of the wedding over and over, always discovering a new detail and reliving that wonderful day through them! Binichic ou comment allier Perfection et Amour… Magnifique ! Tu nous ravies Ona ! Charlotte — tes paroles sont une véritable source d’inspiration! Merci pour ton amitié et soutien!